I like simple men and complicated women. 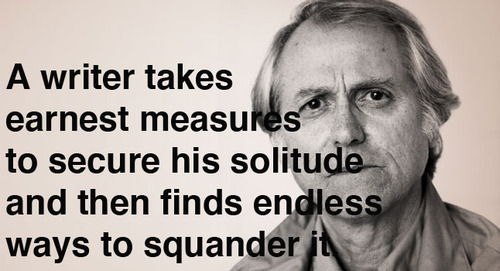 A writer takes earnest measures to secure his solitude and then finds endless ways to squander it. Time and death: It’s the ultimate vision of an artist at the end of everything. It’s just what’s there. It was not something I planned to do. The dead have come to take the living. The dead in winding-sheets, the regimented dead on horseback, the skeleton that plays a hurdy-gurdy. A conspiracy is everything that ordinary life is not. It’s the inside game, cold, sure, undistracted, forever closed off to us. We are the flawed ones, the innocents, trying to make some rough sense of the daily jostle. Conspirators have a logic and a daring beyond our reach. Men with secrets tend to be drawn to each other, not because they want to share what they know but because they need the company of the like-minded, the fellow-afflicted. To a writer, madness is a final distillation of self, a final editing down. It’s the drowning out of false voices. Tourism is the march of stupidity. I’ve come to think of Europe as a hardcover book, America as the paperback version. What we are reluctant to touch often seems the very fabric of our salvation. It’s my contention that each book creates its own structure and its own length. I’ve written three or four slim books. It may be that the next novel is a big one, but I don’t know. The power of the dead is that we think they see us all the time. The dead have a presence. Is there a level of energy composed solely of the dead? They are also in the ground, of course, asleep and crumbling. Perhaps we are what they dream. No sense of the irony of human experience, that we are the highest form of life on earth, and yet ineffably sad because we know what no other animal knows, that we must die. Sometimes a thing that’s hard is hard because you’re doing it wrong. Writers in repressive societies are considered dangerous. That’s why so many of them are in jail. When you try to unravel something you’ve written, you belittle it in a way. It was created as a mystery. There’s never a dearth of reasons to shoot at the President. There’s a moral force in a sentence when it comes out right. It speaks the writer’s will to live. 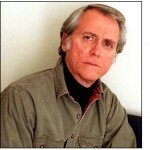 Don DeLillo is an American essayist, novelist, playwright, and short story writer. His works have covered subjects as diverse as television, nuclear war, sports, the complexities of language, performance art, the Cold War, mathematics, the advent of the digital age, and global terrorism.